Since insulin pens were first introduced in 1985, many advances have been made in pen needles (PNs). In this study we evaluated patient-reported outcomes of an investigational newly re-engineered 4 mm × 32G PN, the BD Nano™ 2nd Gen (also known by its “PRO” brand extension in many markets outside of the USA). In place of a conventional cylindrical posted hub, the investigational PN’s hub is contoured with an expanded surface area. The investigational PN also includes a redesigned inner shield that includes tactile ridges and a remodeled outer cover with improved proportions and attachment grips. This was a multi-site, prospective, open-label, two-period crossover trial. Individuals with type 1 and type 2 diabetes using 32G PNs of ≤ 6 mm in length for ≥ 4 months were eligible. Subjects using 31G PNs of a similar length were eligible after a 2-week wash-in period. Subjects were assigned to one of four groups, with each group using a commercially available PN to which the investigational PN was compared. Each of the two study periods were 15 days: one with the investigational PN and the other with a comparator PN. After completing both study periods, subjects compared experiences between the two PN types. A 150-mm comparative visual analog scale (VAS) was used to evaluate overall preference (primary endpoint) and several secondary endpoints, including overall comfort, injection pain, and ease of use. Data from the four PN groups were combined after poolability was verified. Subgroup analyses were also conducted on each PN group. For VAS responses, a two-sided 95% confidence interval (CI) was calculated for average rating. Threshold for non-inferiority or superiority was established at the lower bound CI of > − 10 mm or > 0 mm, respectively. At baseline, average age of subjects was 55.6 years; 51.6% were female; and 85.1% has type 2 diabetes mellitus. Average diabetes duration was 14.2 years, and average duration of injecting was 7.8 years. The investigational PN demonstrated superiority for all outcomes, both primary and secondary, for all groups combined (p < 0.05). The investigational PN was rated as being overall preferred, more comfortable, less painful, and easier to use when compared to comparator PNs of similar gauge and length, in all groups combined. BD (Becton, Dickinson, and Company). To view enhanced digital features for this article go to https://doi.org/10.6084/m9.figshare.7655606. A correction to this article is available online at https://doi.org/10.1007/s13300-019-0623-5. Subcutaneous (SC) insulin delivery devices have advanced significantly over the last four decades, with the aim to improve the safety and quality of life for individuals living with diabetes who require insulin treatment. These advances include dose-appropriate syringe sizes, insulin pens, thinner and shorter needles (with both syringes and pen needles), and insulin pumps. Insulin therapy, in both type 1 and 2 diabetes, requires patients to be continuously diligent with the balance of insulin dosing, food intake, and physical activity. Determining whether or not these device changes decrease the burden on patients requires studies that evaluate patient-reported outcomes. Along with efficacy and safety data, patient-reported outcomes provide a more complete and comprehensive perspective of the clinical, psychological, and social impact of insulin delivery devices . The benefits of insulin pens over syringes have been described and confirmed in several studies, and include greater dose accuracy, patient preference, and ease of use [2, 3]. Over time, both shorter and thinner pen needles (PNs) have proven to be efficacious and preferred over longer and thicker needles [4, 5, 6, 7, 8, 9, 10]. Ultrasound studies of injection site skin and SC fat thickness have shown that shorter needles also reduce the risk of inadvertent intramuscular injections [11, 12, 13, 14]. This is important since inadvertent intramuscular (IM) injections can increase the rate and variability of insulin absorption, increasing maximum plasma concentration and reducing half-life, which may result in hypoglycemia . Historically, patients were required to inject insulin using 16 mm PNs; today, shorter needles are not only preferred by the patient, but they also provide equivalent glycemic control in all adults, including those with a body mass index (BMI) of ≥ 30 kg/m2 [4, 5, 6]. Needle gauge (or thickness; G) has also undergone significant size reduction. Thirty-two gauge PNs with an extra-thin wall (XTW) cannula are preferred by patients, and they require less time and thumb force to deliver the injection compared to thin wall PNs . Needle tip geometry has also evolved with the five-bevel PN tip, which has been shown to be less painful than three-bevel PN tips . More recently, thinner PNs (33G, 34G) have become available, and their use has been demonstrated to cause less injection pain and bruising, with no effect on glycemic variability, when compared to other PNs with conventional design [9, 10]. While there have been innovations with shorter and thinner PNs, the pen needle hub design has largely remained the same, with the exception of two PNs, NovoFine® and NovoTwist®, developed by Novo Nordisk A/S (Bagsværd, Denmark). In the study reported here, we have evaluated an investigational PN (Nano™ 2nd Gen, also known by its “PRO” brand extension in many markets outside of the USA) developed by BD (Franklin Lakes, NJ, USA) which has an innovative hub face geometry, using patient-reported outcomes. This hub design was engineered with the aim to reduce the impact of variability in injection technique and improve the injection experience. Most PNs are designed with a cylindrical posted hub, while the investigational PN’s hub is contoured with a re-engineered surface area. In addition, this new PN includes a redesigned inner shield that includes tactile ridges and a remodeled outer cover with improved proportions and attachment grips, with the aim to improve the overall injection experience (Fig. 1). 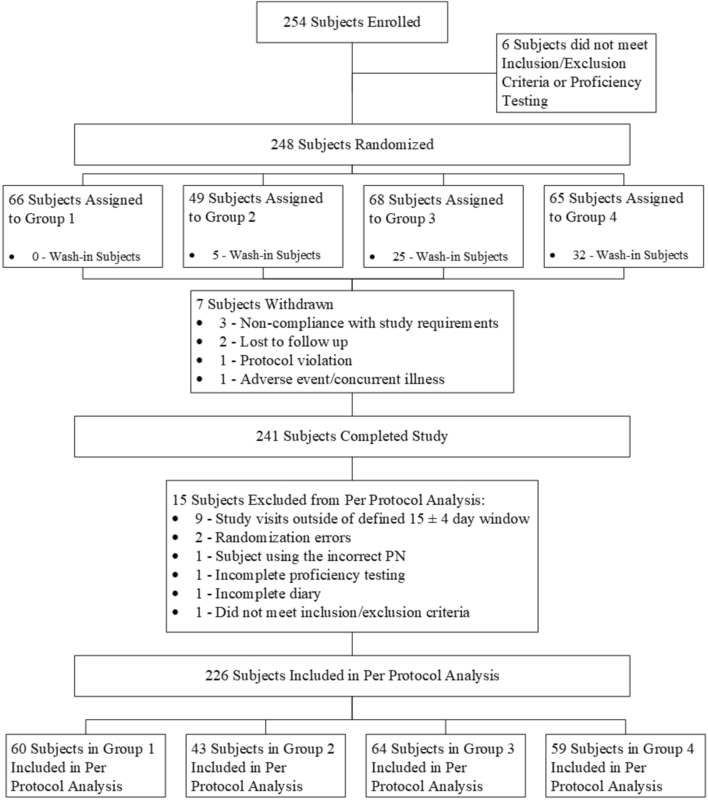 This prospective, multicenter, open-label, randomized two-period crossover study was designed to assess patients’ perceptions of insulin injections with the investigational PN or a comparator 32G PN. Subjects were 18–75 years old, with type 1 or type 2 diabetes, and currently administering either insulin or other injectable diabetes medications (e.g., glucagon-like peptide 1 [GLP-1] agonists) at least once daily with an injection pen and PN. Subjects were required to have a minimum of 4 months of total self-injecting experience with a pen device, including at least 2 months with a 31G or 32 G PN of ≤ 6 mm in length. Subjects were excluded if they were pregnant; taking anti-platelet therapy or anticoagulants (up to 81 mg aspirin was permitted); had a history of a bleeding disorder or easy bruising, blood borne infection(s), recurrent dermatological conditions or skin disorders, gross skin anomalies or abnormalities located very close to the injection site; feared needles; had history of symptomatic hypotension or syncope during injections; were planning to use prescription analgesic medications during the study; or if they had any concurrent or previous medical condition that would have placed them at risk or rendered them unable to complete the study procedures. The study protocol was reviewed and approved by IntegReview, an independent review board, and the study was registered in the ClinicalTrials.Gov registry (NCT03267264). All subjects provided written informed consent. All procedures performed in studies involving human participants were in accordance with IntegReview and with the 1964 Helsinki declaration and its later amendments or comparable ethical standards. Informed consent was obtained from all individual participants included in the study. Subjects were assigned to one of four PN groups on the basis of their current at-home PN use. If a group reached its required sample size or if a subject was not currently using a PN associated with a study group, a randomized wash-in period with one of the study PNs was required prior to study entry (see Table 1). All subjects made at least three study visits, with subjects requiring a wash-in making an additional visit. Additional details on study design and on subject flow through enrollment, randomization, and study visits are provided in Figs. 2 and. 3 respectively. During Visit 1, all subjects were screened and enrolled, signed an informed consent, and were required to demonstrate proficiency injecting with a PN and pen device. Subjects were also provided demographic and diabetes history information during Visit 1. During Visit 1, subjects who were currently using 31G PNs of ≤ 6 mm in length were eligible to be randomized to one of the four PN subgroup for a 2-week wash-in period. These subjects continued in this group for the duration of the study. Wash-in subjects were randomized only to groups containing PNs of the same length as their previously used PN in order to minimize IM injection risk with longer needles, as well as to avoid the need for injection technique modifications (e.g., pinch-up/angled insertion vs. straight-in insertion). Subjects who were currently using 32G PNs of 4 to ≤ 6 mm in length were not required to wash-in and were enrolled into the study group that contained their current PN. If the group containing their current PN was full, these subjects were then eligible for wash-in. For all subjects, the order of PN type, either investigational or comparator PN, was randomized to determine which PN would be used in the first period. For the second period, the alternate PN type was used. Subjects used a diary to log information about each injection, such as bleeding, bruising, bending, leakage, and other adverse events (AEs). After the subjects completed the first 15-day (± 4 days) study period, they returned to the clinical center for Visit 2. Diaries were collected and checked for completeness, and any AEs were reviewed. Subjects were then provided with a new diary and the assigned PNs for the duration of the second study period. After completing Period 2, which was of the same duration as Period 1, subjects returned for their final visit (Visit 3). Diaries and any AEs were reviewed. Finally, subjects completed a survey to compare their experience between the two PNs. This survey used a comparative 150-mm-long visual analog scale (VAS), an example of which is illustrated in Fig. 4 . The primary objective was to compare user overall preference for the investigational PN versus the comparator PNs (all groups combined). For each individual study group, compare user overall preference for the investigational PN versus the comparator PN. Based on previous studies , a standard deviation of 35 mm for the relative VAS was used to calculate a sample size of 60 subjects for 90% power (45 subjects for 80% power) of passing a 10 mm non-inferiority clinical criteria for the primary endpoint of overall preference, assuming a true average of a 5 mm difference in favor of the investigational PN. Scores recorded on the relative VAS were adjusted to reflect the order of PN used in each study period (for analysis, positive scores reflected better performance for the investigational PN, and negative scores reflected better performance for the comparator PN). For each outcome measured on a relative VAS, a two-sided 95% confidence interval (CI) was calculated for the average rating. A modeling approach was used to adjust for the PN order effect and to determine the statistical acceptability to combine the results from the four PN groups followed by CI calculations for the least-square means. Results were tested for non-inferiority (non-inferiority criterion of − 10 mm), followed by superiority. The analysis of the binary responses of bleeding, bruising, leakage, and bending was performed using a mixed effect logistic regression (subjects as random effects; PN group and PN as fixed effects). Results were assessed for the ability to combine the four PN groups and the difference (investigational vs. comparator) in the proportion of occurrence of the various responses estimated with the 95% CI. Results were tested for non-inferiority (non-inferiority criterion 4%). Both per-protocol (PP) and intent-to-treat (ITT) analyses were performed. Primary results were based on the PP analysis, with the ITT analysis conducted to assess robustness of the results. The choice of PP analysis for primary results was based on the shortness of the study (no issues of non-random loss of participants) and the crossover nature of the study with comparative outcomes: subjects not experiencing both PN types or with major out-of-window deviations could not perform valid comparisons. There were no differences in the results between the PP and ITT analyses for all groups combined. Any differences at the subgroup level are noted in the figure captions of the Results section. The study was conducted from September 2017 to May 2018 at four US investigational sites. Of the 241 subjects who completed the study, 15 were not included in the PP analysis—nine due to study visits outside of defined 15 ± 4 day window, two due to randomization errors, one due to the subject using the incorrect PN, one due to incomplete proficiency testing, one due to incomplete diary, and one due to subject not meeting inclusion/exclusion criteria. A total of 226 subjects were included in the PP analysis (see (Fig. 3 for details). A visual representation of results for all groups combined is provided in Fig. 5, and Fig. 6a–d provides a visual representation of results for each of the individual subgroup separately. For all VAS questions, the investigational PN was rated as being significantly preferred versus all comparator PNs combined (Table 3). 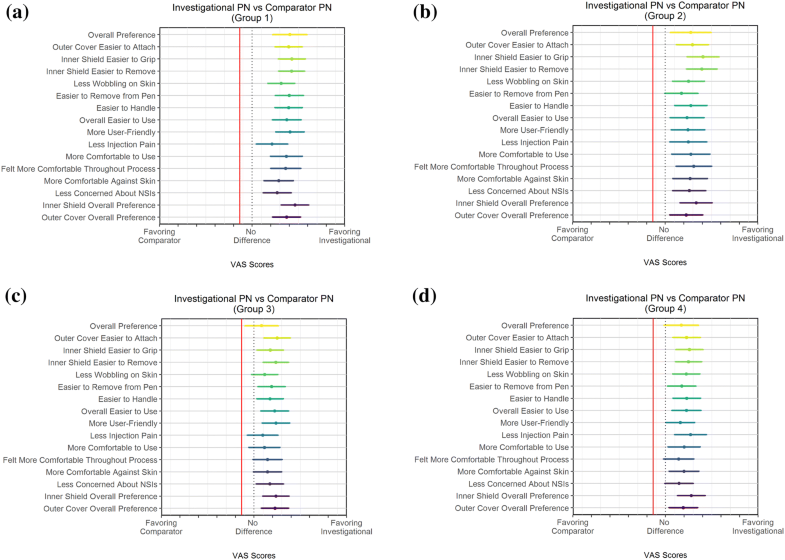 Figure 7 shows the percentage of subjects who either preferred the comparator PN, had no preference for either, or preferred the investigational PN. Superiority concluded (lower bound of CI > 0)? Which pen needle’s outer cover was easier to attach the pen needle to the pen device? Which pen needle’s inner shield was easier to grip? Which pen needle’s inner shield was easier to remove? Which pen needle’s base provided an improved ability to hold the pen securely against the skin without wobbling while injecting? Which pen needle was easier to remove from the pen device? Which pen needle was easier to handle? Which pen needle was overall easier to use, from attachment through to disposal? Which pen needle was more user-friendly? With which pen needle did you experience less injection pain? Which pen needle was more comfortable to use? Which pen needle made you feel more comfortable throughout the injection experience (from attachment to disposal)? Which pen needle base did you find more comfortable against your skin during the injection process? With which pen needle were you less concerned about accidental needlestick injuries to yourself? Which pen needle inner shield did you prefer overall? Which pen needle outer cover did you prefer overall? Even though all of the PNs in this study were 32G, the investigational PN was rated more comfortable to use (+ 11.3 mm). The increased size and ergonomic design enhancements of the investigational PN were also preferred: less concerned about accidental needlestick (+ 9.9 mm); overall preference (+ 10.3 mm); user friendly (+ 13.8 mm); overall for inner shield (+ 18.9 mm) including ease to remove (+ 18.9 mm) and grip (+ 18.1 mm); overall for outer cover (+ 13.2 mm) and ease to attach to pen (+ 16.1 mm); ease of use/handling (+ 14.4 mm); and easier to attach to and remove from the pen (+ 11.7 mm). Patients also found the investigational PN to be less painful (+ 8.9 mm), more comfortable overall (+ 11.6 mm), more comfortable to use throughout the injection process, and more comfortable when pressed against the skin (+ 10.8 mm), and that there was an improved ability to hold the pen securely against the skin without wobbling while injecting (+ 11.3 mm). Finally, patients reported being less concerned about accidental NSIs to themselves (+ 9.9 mm). In all groups combined, the investigational PN was significantly preferred overall by patients versus the comparator PNs. Within the individual PN groups, the investigational PN was significantly preferred in Groups 1 and 2 and was found to be non-inferior in Groups 3 and 4. In all groups combined and in each individual PN group, the outer cover of the investigational PN was found to be easier to use to attach the pen needle to the pen device, easier to grip, easier to remove, easier to handle, easier to use from attachment to disposal, and more user friendly. In all of the four groups combined and in Groups 1, 3, and 4 individually, the investigational PN was found to be easier to remove from the pen device, and found to be non-inferior in Group 2. In all of the four groups combined and in Groups 1, 2, and 4 individually, the investigational PN provided an improved ability to hold the pen securely against the skin without wobbling during an injection. This was found to be non-inferior in Group 3. The investigational PN was found to be statistically significantly less painful for all groups combined. For each of individual PN Groups 1, 2, and 4, the investigational PN was also found to be less painful. The investigational PN was found to be non-inferior for injection pain compared to the PNs in Group 3. In all groups combined, the investigational PN was found to be more comfortable to use, made subjects feel more comfortable throughout the injection experience, and its base was found to be more comfortable against the skin during the injection process. In the individual PN groups, the investigational PN was also found to be more comfortable to use and more comfortable against the skin during the injection in Groups 1, 2, and 4. Non-inferiority was found in Group 3. The investigational PN made subjects feel more comfortable throughout the experience in Groups 1 and 2, and was found to be non-inferior in Group 3 and 4. Subjects in all groups combined and each of the four subgroups preferred the inner shield and outer cover of the investigational PN. For self-reported needle bending, bleeding, bruising, and leakage at the injection site, the investigational PN was found to be non-inferior compared to the comparator PNs for all groups combined, when poolable, and for each individual PN group (Table 4). Non-inferiority concluded (upper bound of CI < 4%)? There were 72 reported AEs; of these, 68% were reported while using the investigational PN, and 32% were reported while using the comparator PNs. Sixty-nine AEs were assessed as non-serious, and three were deemed to be serious. None of the serious AEs took place while using the investigational PN. The most frequent non-serious AEs were bleeding (30 events), bruising (16 events), and mild swelling/pain at the injection site (11 events). Three AEs were considered to be severe: influenza (1), broken right ankle (1), and infection of the left hand (1). None of these were related to the investigational device or study protocol. The investigational PN has undergone other improvements that are designed to enhance the ability of patients to use PNs more easily. These include a larger outer needle cover with ergonomically designed grooves for gripping, which makes it easier to attach and remove the outer needle cover from the pen, and a colored, larger, more prominent inner shield, which makes it easier to remove the inner shield and more apparent that the inner shield needs to be removed. This clinical study showed that these PN improvements were consistently preferred by the patients. The investigational PN was significantly preferred by patients in the analysis of all groups combined, as shown by the scores for all 16 comparative questions in Table 3; Fig. 5), with the lower bound of the 95% CI of the mean score being > 0 mm. The lower bound 95% CI ranged from 8.9 to 24.6 mm. 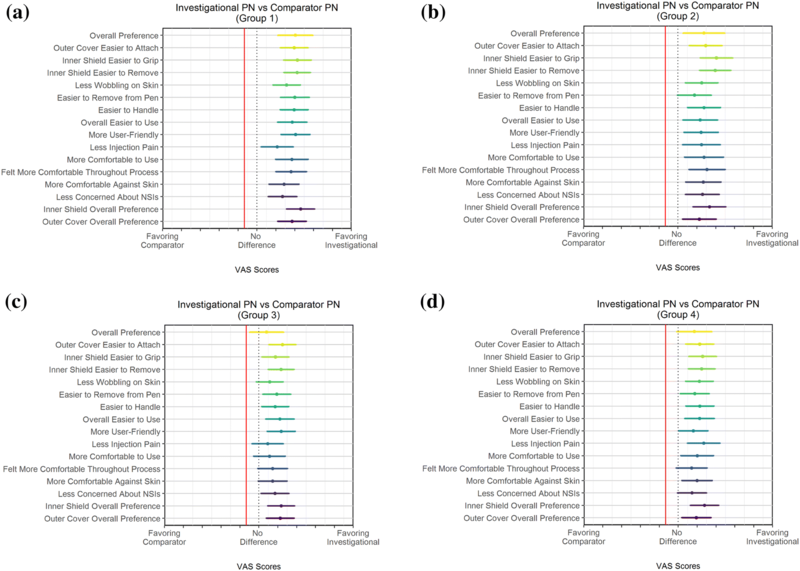 Of those who had a preference for either PN, i.e., comparator PN versus investigational PN (Fig. 7), enhancements to the inner shield were preferred most significantly, with 3.9-, 4.4-, and 4.5-fold more subjects preferring the investigational PN over the comparator PNs for the inner shield being easier to grip, easier to remove, and overall preference, respectively. Changes to the outer cover were also valued, with 3-, 2.5-, and 3-fold more subjects assessing the outer cover of the investigation PN to be easier to attach to the pen, easier to remove, and preferred overall versus current/assigned PNs, respectively. Less pain and more comfort ratings favored the investigational PN, with 2-fold more subjects reporting less pain with the investigational PN, 2.2-fold reporting that it was more comfortable, and 2.6-fold reporting that It was more comfortable against the skin. Additional preferences were for ability to hold the pen securely against the skin without wobbling (threefold) and less fear about a self-inflicted needlestick (2.7-fold). Finally, 1.8-fold more subjects preferred the investigational PN overall versus their current/assigned PN. Several higher order questions on patient experience related to composite device use, including ease of handling, overall ease of use, and more user-friendly patient assessments, between the investigational PN versus comparator PN were also favorably evaluated. Among those with a preference, preferences appeared to remain around threefold higher in favor of the investigational PN, which appears to further support that the changes to the ergonomic design of various components of the investigational PN contributed to the subject’s perspective on ease-of-use factors. The investigational PN has a cannula with a 32G outer diameter and is 4 mm in length. These specifications have been shown in prior research to be associated with less pain and to be preferred by patients, while still providing equivalent glycemic control as the longer PNs . A prospective crossover randomized controlled trial evaluated the 4 mm × 32G BD PN versus the 8 mm × 32G BD and 12.7 mm × 32G BD PNs in obese American patients taking insulin doses of up to 300 units per day, and confirmed the findings in the previously reported trials . An earlier study in obese patients compared subject experiences with the 12.7 mm × 29G PN versus the 6 mm × 31G PN . This study reported demonstrated similar findings, with subjects favoring the shorter PNs, which provided equivalent control as measured by glycated hemoglobin level. There have been improvements to the cannula over the years, such as increasing the number of bevels on the PN from three to five. In one study that compared the three-bevel PN cannula to the five-bevel PN cannula, it was noted that 23% less penetration force was required with the five-bevel cannula . The 86 patients completing the take-home cross-over phase of that study rated the five-bevel cannula as being significantly more comfortable, easier to insert, and more preferable, compared to their usual PN (3-bevel) . With thinner cannula, however, the inner diameter is also narrower, which slows the flow of insulin through the needle. In one study that evaluated PNs with an XTW cannula (increased inner diameter) versus patients’ usual PN , the XTW PN was significantly preferred overall, required less thumb force and less time to deliver the dose, and increased the overall confidence of patients that the full dose was delivered. In the present study, we investigated a five-bevel, XTW, 4 mm × 32G PN with significant modifications to the outer needle cover, the inner needle shield, and hub (Fig. 1). The re-engineered hub is intended to decrease injection pain and increase comfort, and also addresses variability in injection technique that may impact injection depth and risk for IM injection [17, 18]. Insulin is intended to be injected into the SC tissue, since IM delivery can variably impact absorption rates and the time action profile and should therefore be avoided due to the potential for severe hypoglycemia [15, 19, 20, 21]. The investigational PN demonstrated superiority for each aspect of PN use, from attaching the PN to the pen, to injection pain, to removing the PN from the pen. With all study groups combined, patients significantly preferred the investigational PN for all of the aspects of the PN tested and for injection experience, including overall preference, ease of use, injection pain, comfort, and anxiety. Each of these endpoints was also found to be superior in the investigational PN when compared to the BD Nano™ PN (Group 1). In each of the other individual subgroup, many of the endpoints met superiority, but the results were somewhat variable. In particular, the investigational PN was found to be non-inferior in several endpoints compared to the comparator PN in Group 3. This is most likely due to the lack of a cannula post in both the investigational and comparator PN. Patient preference for the investigational PN may decrease patient resistance to continuing insulin therapy and may reduce the burden of the disease and improve clinical outcomes, but this remains to be proven . 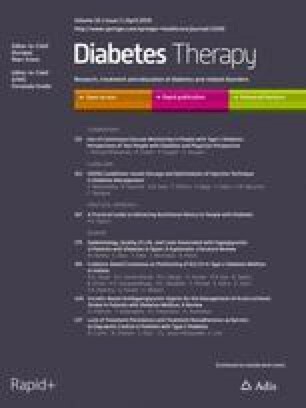 Poor therapy adherence and persistence in patients with type 2 diabetes is well-reported and is a large contributing factor to inadequate glucose control . The investigational PN was similar to the comparator PNs for bleeding, bruising, bending, and leakage, thus leading to the conclusion that this preferred PN design had no negative effects on injection site complications. The limitations of this study include the study design, which did not allow for blinding of the PNs, potentially affecting the perspective of the subjects. Although the study duration was limited to 15 days per crossover period, this short time period was necessary to allow patients to adequately recall and compare the two types of PNs. The required 2-week wash-in for a subgroup of subjects who were not currently using a 32G PN may have influenced this group’s responses. Responses of subjects who completed the wash-in period were not found to be statistically different than those that did not require a wash-in. Additionally, due to the subjective nature of the VAS scale, subject-specific factors may have influenced patients’ individual perceptions and subsequent responses to the survey questions. These factors may include—but are not limited to—severity of the disease, frequency of injecting, pain sensitivity, and BMI. The re-engineered hub face geometry of the 4 mm, 32G investigational PN evaluated in this study is intended to minimize variability in injection depth. 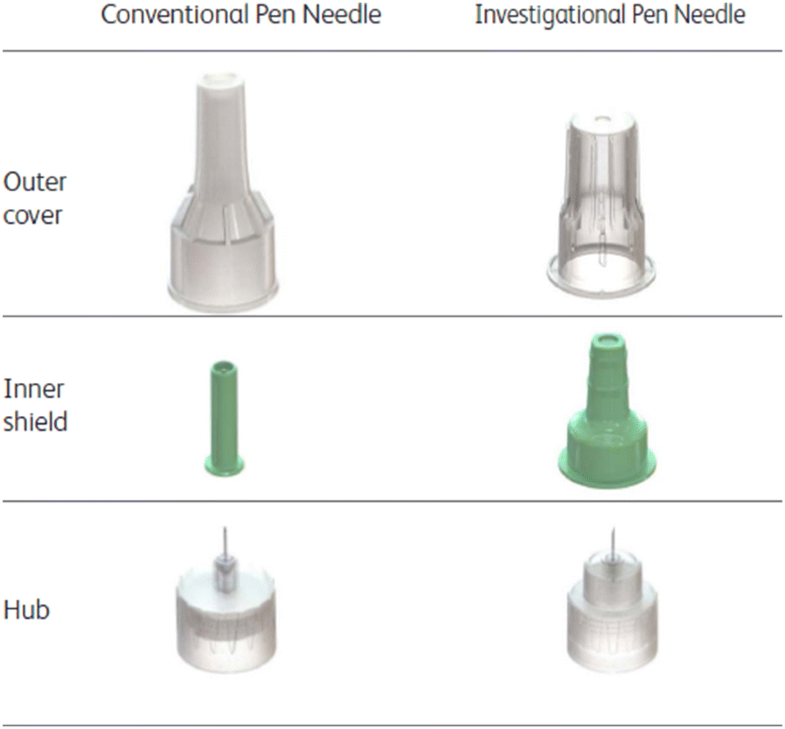 Additional redesigns of the needle cover and shield demonstrated improvement in the overall injection experience. The investigational PN demonstrated superiority in overall preference and for all other VAS endpoints, including ease of use, injection pain, overall comfort, anxiety, and preference for various components, when compared to comparator PNs of similar gauge and length. Non-inferiority was shown for bleeding, bruising, bending, and leakage. These changes in the investigational PN improved the injection experience of patients. Future research evaluating the impact of the re-engineered hub face geometry on glycemic endpoints should be considered. We would like to thank all of the patients who participated in this study, and the principal investigators at each of the four sites (Dr. Toby Briskin, Dr. Garfield Samuels, Dr. Brian Short, and Dr. David Fitz-Patrick). We would also like to thank the BD Global Clinical Development team members who contributed to the planning and execution of this study (Natalie Bascom, Joshua Koch, Ruth Le, Fred Mosqueda, Jeannine Paliotta, and Falguni Patel). Thank you to Anastasia Ermakova and Michael Rickson for their contributions. BD (Becton, Dickinson, and Company) provided funding for this study. BD also funded the article processing charges. All authors had full access to all of the data in this study and take complete responsibility for the integrity of the data and accuracy of the data analysis. Shahista Whooley is an employee of BD. Dr. Toby Briskin served as a principal investigator for this study. Michael A. Gibney is an employee of BD. Lydia Blank is an employee of BD. Julie Berube is an employee of BD. Brian K. Pflug is an employee of BD. The study protocol was reviewed and approved by IntegReview, an independent review board, and the study was registered on ClinicalTrials.Gov (NCT03267264). All procedures performed in studies involving human participants were in accordance with IntegReview and with the 1964 Helsinki declaration and its later amendments or comparable ethical standards. Informed consent was obtained from all individual participants included in the study.